Question: China, China, China — when are you going to tell us about something other than the Chinese economy and Chinese stocks? Okay, I admit it. I have devoted a lot of this column to China, but I have done so because China is the fastest-growing country in Asia. Plus, there are more Chinese stocks listed on U.S. stock exchanges than any other Asian country. While there are dozens of stocks from other Asian countries — Japan (Toyota, Canon, Hitachi), Taiwan (Garmin, Taiwan Semiconductor, AUO Optronics), South Korea (POSCO, LG Philips, SK Telecom), and India (Wipro, Infosys, ICICI Bank) — listed on the NYSE or Nasdaq, there are more than 100 Chinese stocks listed in the United States. Yeah … more than 100! That’s why it’s as easy to buy shares, for example, of China Mobile (CHL) as it is to buy AT&T for American investors. You don’t need a foreign brokerage account or get nailed for sky-high commissions, either. That is why I continue to urge you to keep the bulk of your Asian investment dollars in China. There are, however, loads of opportunities in neighboring Asian countries, and I want to expose you to two of the least appreciated and potentially most profitable investment opportunities in all of Asia. I’m talking about Vietnam and Indonesia. I consider investing in Vietnam today to be the equivalent of investing in China 10 years ago. Who wouldn’t like to go back 10 years in time and buy a boatload of Chinese stocks? That is how dynamic and full of economic promise Vietnam is today. Like China, Vietnam is a communist country, and while it got a much later start, it is now copying China by embracing capitalism with a vengeance. Vietnam is rapidly becoming the low-cost manufacturing center of Asia. Financial reforms have dramatically changed the business landscape in Vietnam, hundreds of government-owned companies are being privatized, and the opening of the Vietnam stock exchange is attracting billions of foreign investment dollars. Vietnam has abundant natural resources and has historically been a large exporter of rice, oil, cashew nuts, and black pepper. Thanks to its young, hard-working population of 90 million citizens, extremely low wages, and strategic location near China, Vietnam is rapidly becoming the low-cost manufacturing center of Asia. Even Chinese companies are now offshoring some of their manufacturing to Vietnam. 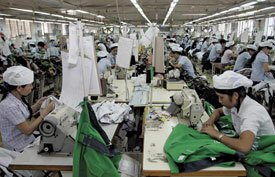 An executive at Yue Yuen International, the largest branded shoe manufacturer in the world, told me that the labor costs at their Vietnam factory were more than 40 percent lower than at its China factories. As China prospers, it is going to outsource even more of its manufacturing to Vietnam and enrich its economy and citizens. Can you name the four most-populated countries in the world? The first three are easy — China, India, the United States. The fourth may surprise you … it is Indonesia. Indonesia is a country of 17,000 separate islands that have historically straddled trade routes that have been important for centuries. Like Vietnam, Indonesia is rich in natural resources, but its wealth comes from not only agricultural goods but also from energy and mineral resources such as oil, natural gas, gold, and copper. In fact, Indonesia is the only Southeast Asian member of OPEC. Indonesia’s vibrant internal market makes it less dependent on exports. The vibrant internal market makes the country less dependent on exports than many Asian markets. In fact, Indonesia’s service sector is larger than its industrial and agricultural counterparts. In the second quarter of this year, Indonesia grew at a 4 percent annualized rate, making it the third-fastest-growing economy in Asia behind China and India. Indonesia is growing so fast that Morgan Stanley suggested it should be included with Brazil, Russia, India and China in an acronym expanded from BRIC to BRIIC. Two-thirds of that growth is coming from domestic consumption instead of exports, so Indonesia has been largely immune from the global slowdown. The bad news for American investors is that there isn’t a single Vietnamese stock listed on any U.S. exchange. Furthermore, you actually have to travel to Vietnam to open a brokerage account with a Vietnamese broker to buy/sell Vietnamese stocks. And even then there are restrictions on how long you must leave your money in Vietnam. NOTE: Several Vietnamese stocks are listed on the London Stock Exchange, another market that is simple, easy, and cheap for American investors to access. There are two Indonesian stocks listed on the NYSE, PT Indostat (IIT) and Telkom Indonesia (TLK), both large telecommunications providers. Beyond that, you will need to open an Indonesian brokerage account to take on the Jakarta Stock Exchange. Here’s a heads up: I will be traveling to Indonesia later this year to find the single best Indonesia stock to own. I’ll be visiting companies like plantation giant Golden Agri-Resources, Indonesian coal king Bumi Resources, and others that I don’t want to let out of the bag just yet. If you sign up for my Asia Stock Alert newsletter, you’ll be the first to know! The good news is that there are two exchange traded funds or ETFs that can give you broad and profitable exposure to both markets. Market Vectors Vietnam (VNM). This ETF offers broad exposure to the entire Vietnamese economy, including financial, energy, industrial, and consumer companies. Top holdings include Viet Nam Dairy Products, Hoa Phat Group, Saigon Thuong Tin Commercial, HAGL, PetroVietnam Fertilizer & Chemical, and PetroVietnam Drilling and Well. New ETF: Market Vectors Indonesia (IDX). With IDX, you can buy into the Indonesia growth story quickly and easily. This ETF includes banks, telecom, energy, materials, and industrial stocks and with an average P/E of 13, one of the best bang-for-buck valuations in all of Asia. I’m not suggesting that you rush out and buy either one of these ETFs tomorrow. Both the Indonesia and Vietnamese stock markets have had quite a run up, so I suggest you wait for them to get cheaper. Here’s what I mean; IDX is up 70 percent in the last 90 days so it has been red, red hot. Keep your eyes on China, but don’t overlook its Asian neighbors; especially Vietnam and Indonesia. hi ,i want to invest in indonasia and vietnam stock exchange,i stay in india.pls tell me how to open a DEMAT Account in vietnam and indonasia.